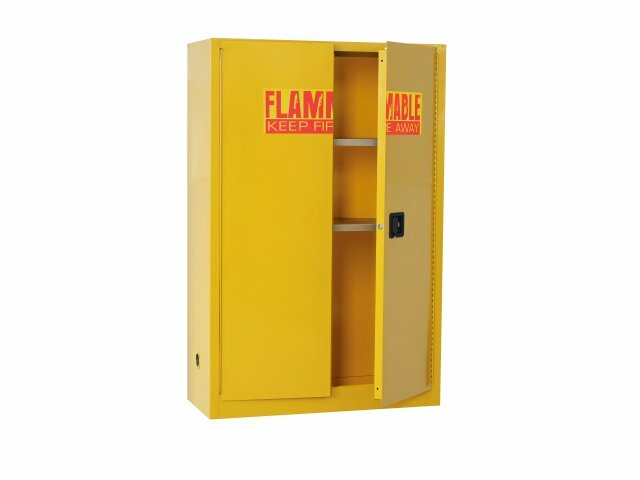 Keep all dangerous liquids safely locked away with this flammable liquid storage cabinet. This unit includes two shelves with a combined capacity of 500 pounds. The total storage area available is equal to 45 gallons. All flammable liquids are kept secure by means of the specially designed double-walled, 18-gauge, welded-steel construction. A 2"-high leak-proof door edge helps contain spills and a keyed locking handle keeps everything secure. The outside is designed for visibility with a prominent warning. 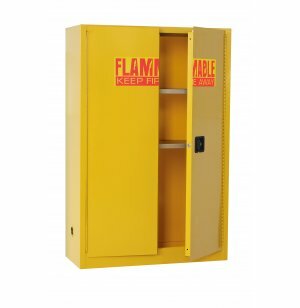 These flammable liquid storage cabinets meet the stringent requirements of the National Fire Prevention Association as well as Occupational Safety and Health Administration. Double-wall, 18-gauge, welded-steel construction with 1 1/2" air space. Dual 2" capped vents with flash arrestors for external exhaust. 2"-high leakproof door sill helps contain spills. Locking handle with 3-point latch. Adjustable galvanized shelves (500-lb. capacity). Includes "FLAMMABLE KEEP FIRE AWAY" label. Meets NFPA Code 30 and OSHA Standard 1910.106 storage of Class I, II and III liquids.